The grand old town of York.. The sweet smell of times past.. I can't even remember the name of the small country town, I'm not sure if there was an actual town anymore.. but there was a sign at the side of the road, 'Cemetery'.. and a gate! The smell of wild freesias growing en-mass around the perimeter of the graveyard and the one sad looking tree was overpoweringly beautiful and yet overwhelmingly melancholy at the same time. I could have shown you a vast yellow canola field but it just needed an extra touch of red to make it that bit more fabulous :) Yesterday we traveled roughly 430kms around the Wheatbelt region of WA, so many small country towns, some so small if you blinked you missed them! Along the way there were beautifully tarred roads, strip roads and sometimes dirt roads.. and many photo stops..
Horses grazing in fields surrounded by purple..
Spring is the best time to take a trip like this, the weather is cool, the wild flowers are out in abundance and the fields are green..
We passed the Dowerin salt lakes below, shimmering pink after the rain..
Below a field of pink ever-lasting daises, Aimee was right in macro heaven :) Named 'the wildflower state', thousands of visitors from around the world visit WA at this time of the year expressly to view the huge expanses and many species of wildflowers around the state, these are just the tip of the wildflower ice-berg! Hope you enjoyed our trip to the country, it's possible there may be more tomorrow :) Happy Tuesday, take care and stay safe... p.s. the sky changed from blue to grey so many times during the nine hour trip, a typical WA day! P.p.s failed to find the piano graveyard..next time! Old buildings and Lego ships..
RAC Intellibus.. look ma, no hands! 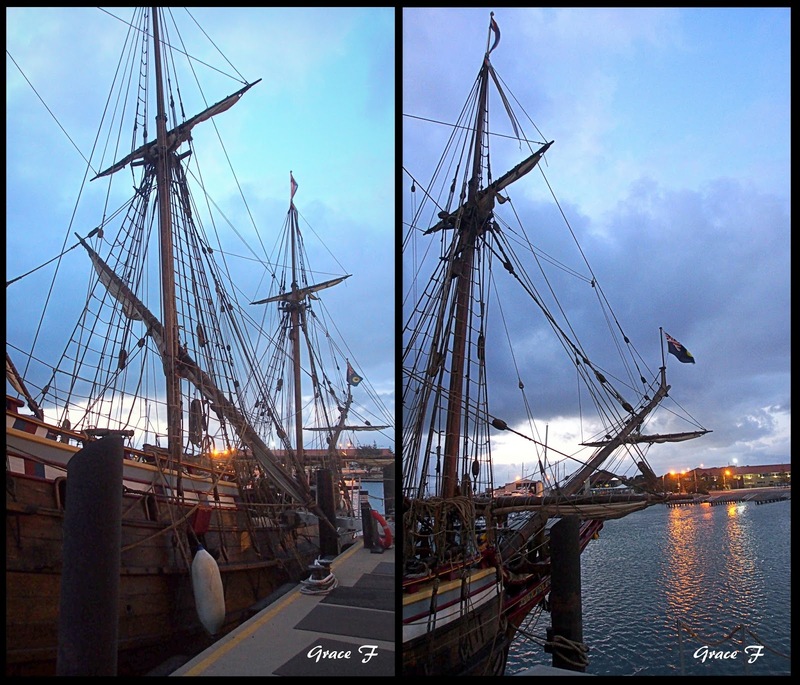 The Duyfken sails in to Hillarys Boat Harbour..
What do you do on those nights when you're trying to get to sleep and your mind refuses to co-operate.. when it would be so good to have an off button :) I think of a 'white space' and concentrate on keeping everything out of that space, sometimes it works, sometimes not so much! I was thrilled last weekend to find this large scale work by Perth mural and installation artist Daek William on the wall of Gemma's Health & Beauty Salon in Maylands. Breakfast at Chapels, so good.. followed by a visual feast, I call that an across the board win :) Happy Tuesday, take care and stay safe..
are a clue that the city is just a stone's throw away.. not literally speaking! This amazingly complex, yet fragile window design, created by one of my favourite Perth artists Robert Jenkins, whose work you have seen here many times, is on the window of Bar Lafayette in Brookfield Place. It is just one of the many windows created during Windows of the City 2016 . It was the first time I've been inside Bar Lafayette I loved the 'classic old world charm' of the decor, I mean, just look at those sumptuous Chesterfields :) Many more windows to explore but of the few I saw yesterday, this was right up there! Bon weekend, take care and stay safe...p.s. what do you think, better in black & white? What is your Archilles heel? Swans over and on the Swan..
A nod to the past..
Feel the wind in your hair! Fresh air ... this way! East West Design.. 'bigger than a footy oval'. Fibber McGee's.. A céad fáilte! Weekend reflections.. Return of the redhead! Sri Chinmoy.. World peace dreamer.